This statistic shows the number of crime investigations as a result of abortion reported in Mexico in 2017, by state. 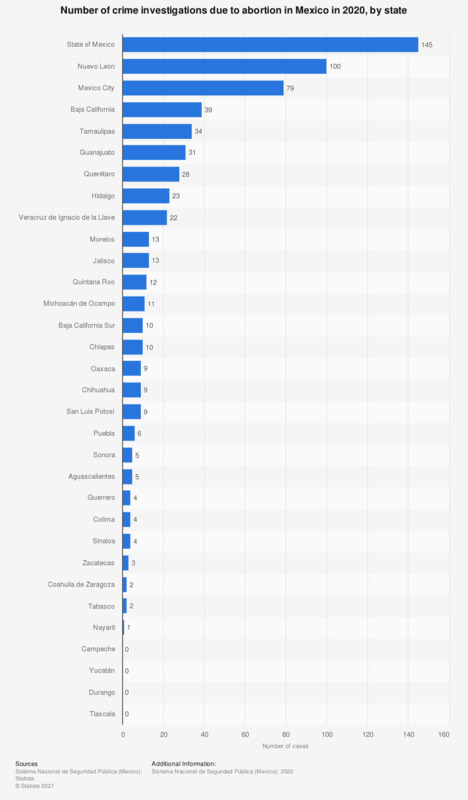 That year, a total of 479 criminal cases due to abortion were brought in the Latin American country, out of which 74 investigations were initiated in Mexico City. * Mexico City is the only jurisdiction in Mexico where abortion is decriminalized, though this must be done within the first twelve weeks of pregnancy, otherwise it is considered a crime and criminal proceedings can be brought. ** Figure calculated by Statista based on the source's data.